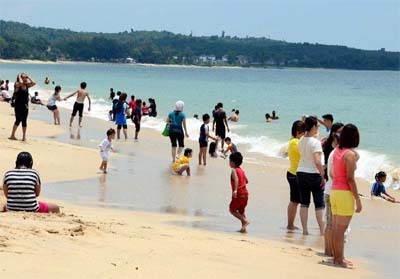 DESARU, a tourist destination that never quite took off, seems to finally be on the right track with growing interests from investors keen to tap the area's tourism prospects. The latest interest comes from UEM Land Holdings Bhd, which announced on Monday that it would develop 678.7 acres of land there on a 51:49 joint-venture basis with Desaru Development Corp, a unit under Khazanah Nasional Bhd, the Government's investment arm. The proposed development, which is estimated to have a RM5.4bil gross development value, will be completed in 20 years. “Desaru is expected to be earmarked as the leisure and tourism region for Johor, offering an integrated resort lifestyle experience with world-class leisure and tourism accommodations, entertainment and attractions,” UEM Land said in a statement. “Such development of Desaru as an international tourist destination will be spearheaded by Khazanah,” the company added. UEM Land said Khazanah's masterplan for Desaru would involve the proposed development of international hotels with renowned operators, two world championship golf courses, convention centre, themed attraction parks as well as other commercial and retail components. The company also said the completion of the final 27km stretch of the Senai-Desaru Expressway, which now allows for reduced travel time between Johor Baru and Desaru, was expected to act as a catalyst for development in the area. “The proposed project also enjoys direct spillover benefits due to its location within the centre of the main project, thus benefiting directly from the planned components under the Desaru Masterplan,” it said. Apart from being a tourist destination, the development of Desaru will also complement Petroliam Nasional Bhd's (Petronas)proposed integrated downstream oil and gas complex in Pengerang in Johor's southeast region. Dubbed the Refinery and Petrochemical Integrated Development (Rapid), the project is aimed at building something larger than Kertih. “Those employed at Rapid, such as expatriates and their families, can look to Desaru, which is not too far away, as an ideal destination to unwind and relax,” said one observer. KGV International Property Consultants executive director Samuel Tan said he was optimistic about Desaru's prospects. In an e-mail reply, PA International Property Consultants Sdn Bhd executive director V. Sivadas concurs that the development within Desaru will tie in with the oil and gas project in Pengerang. “With an expected huge increase of skilled and expatriate staff over the next few years, residential and resort developments will enjoy the spillover effects,” he said. He points out that there had been many plans to transform the entire Desaru belt into a major tourist destination since the 1990s. “(But) it is only in the last one year or two that under the Khazanah leadership and direction, plans seem to be taking off in a big way. “The Desaru development project by Khazanah covers 4,113.29 acres along a 17-kilometre coastline fronting the South China Sea. It is being proposed to be developed into a major tourism and leisure belt,” said Sivadas. He said there would be many opportunities for leisure-based developments within the Desaru belt. He also said there had not been many transactions of lands in the area. “Many are either plantations held by GLCs (government-linked companies) or related parties, or alienated smallholdings held by individuals. With the strong prices for palm oil, we don't expect a rush by major land owners to immediately develop their land bank. “It may be prudent to submit preliminary applications for development while reaping the benefits of the oil palm,” he said. Resorts located at Desaru include Batu Layar Beach Resort, Chalet Pantai Samudra, Desaru Damai Beach Resort, Chalet D'Punggai, Pelangi Balau Resort, Hotel Hiap Hwa, the Sebana Cove & Marina Resort, Balau Bay Resort, Lotus Desaru Beach Resort, the Pulai Desaru Beach and Punggai Beach Resort.